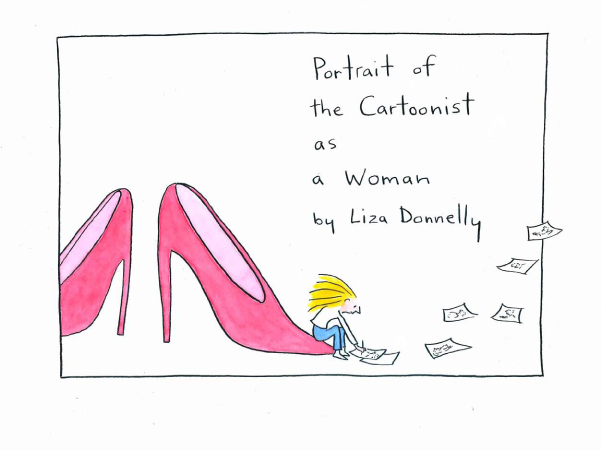 Portrait of the Cartoonist as A Woman | When Do They Serve The Wine? 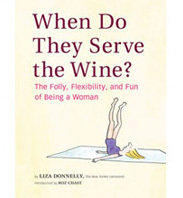 When Do They Serve The Wine was conceived over a period of years, and really began with an idea I had for a graphic narrative. I drew little vignettes about growing up and dealing with wanting to be a cartoonist (from a very early age) and being of the female persuasion (also from a very early age). These little pieces were to be in the book, but Chronicle Books decided they wanted to go another route, and had me put the ideas of the narratives into the short chapter openings that I wrote. It was fine with me…the whole book is somewhat autobiographical in feel. But what makes their decision so perfect is that my cartoons in the book feel universal, and not just about me. If you want to know a little about me, then read the chapter introductions. However, the graphic narratives have found a home in a completed short story comic on Narrative Magazine. When I showed the snippets to Tom Jenks at Narrative (I had been doing single panel cartoons for them for a while), he loved them, and he served as my editor as I connected them and made them into a complete short graphic story. I offer you a link to the narrative here. Many thanks to Tom and Narrative for the encouragement! I hope to do more narratives for them in the future. This entry was posted in About the book, From the Book and tagged cartoonist, cartoons, Chronicle Books, comics, graphic narrative, growing up, Narrative Magazine, self, short story. Bookmark the permalink.